"ঐক্য এবং ন্যায়বিচার এবং মুক্তি"
ক. 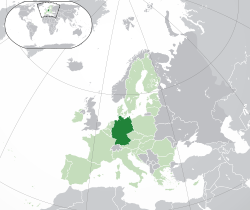 ^ Danish, Low German, Sorbian, Romany and Frisian are officially recognised by the European Charter for Regional or Minority Languages (ECRML). খ. ^ The .eu domain is also used, as it is shared with other European Union member states. ↑ Statistisches Bundesamt: [https://www.destatis.de/DE/PresseService/Presse/Pressemitteilungen/2018/01/PD18_019_12411.html "Bevölkerung in Deutschland zum Jahresende 2016 auf 82,5 Millionen Personen gewachsen". Archived from the original on 16 January 2018.